Taking your time with a slow, positive introduction process leads to long-term harmony. 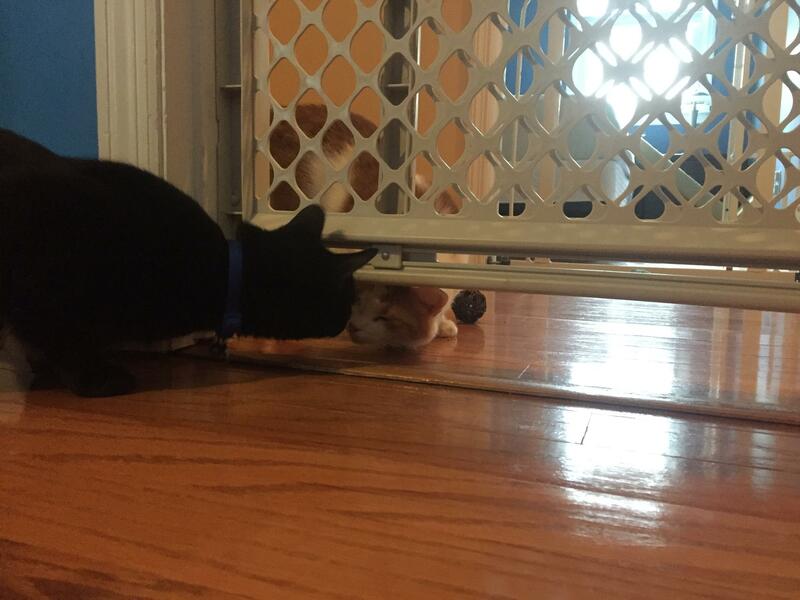 The key to introducing cats to each other is to TAKE IT SLOWLY. Take little steps and evaluate how your cats react. There is no magic formula that will tell you when a cat is ready to be fully integrated into the household; you must be able to observe them and judge their progress on an individual basis. 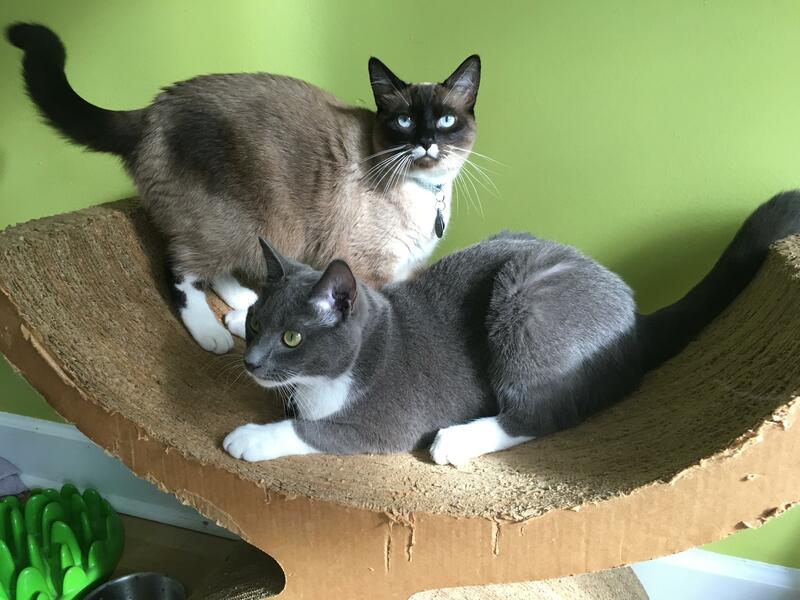 Some say their cats got along beautifully from day one (not that they should have even met that quickly), and others say it took six months or more before they finally lived peacefully under the same roof. 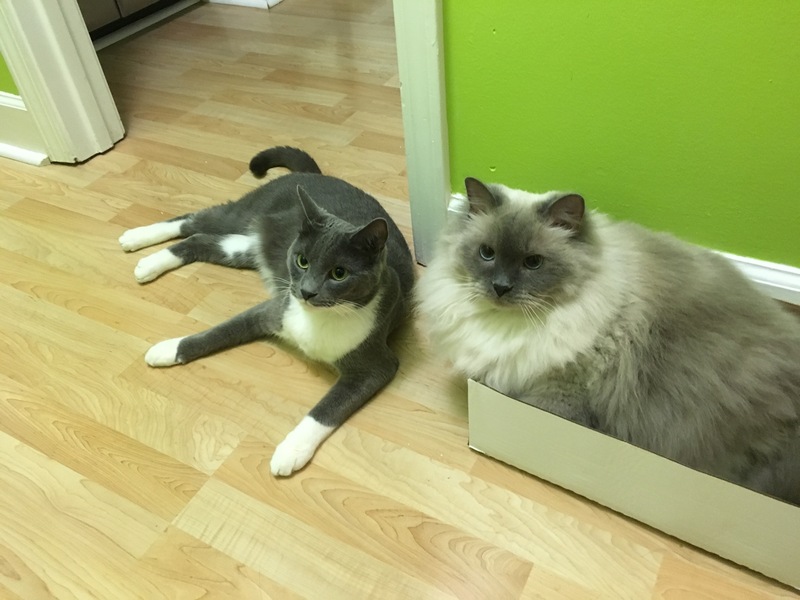 Cats can coexist together most of the time, even if they’re not the best of friends, as long as they are introduced slowly and positively and there are enough resources throughout the home. They should never be forced to share coveted basic needs such as food, water, litter, and perches. 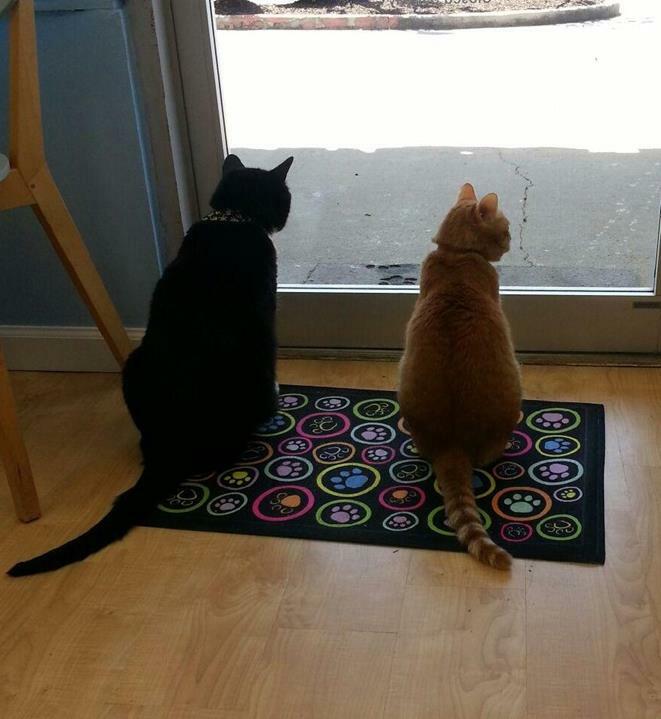 We want to make sure the new cat and the old cat associate good things with that door and what’s on the other side of it. The following is a step-by-step guide on how to do that. 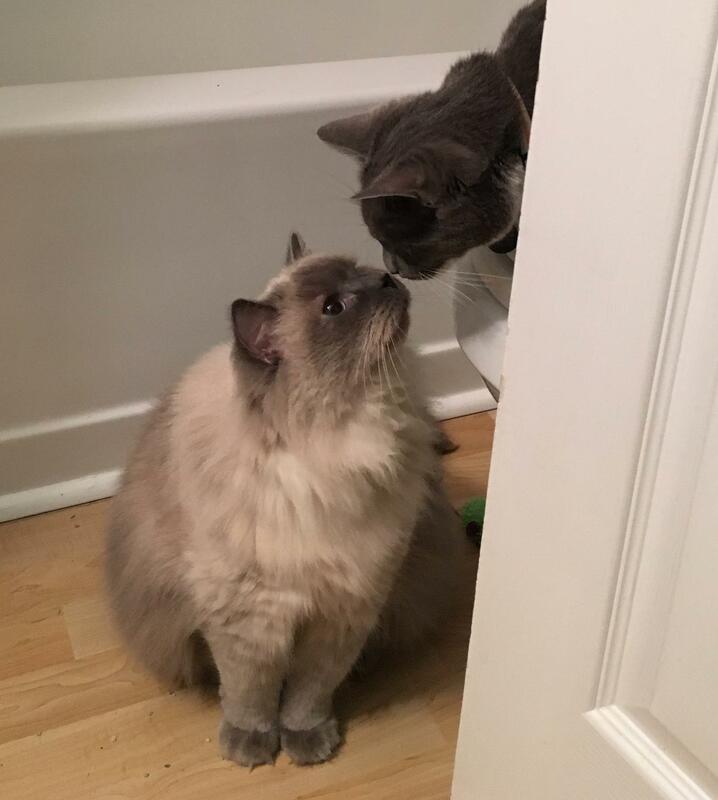 Two cats touching noses for the first time, a very high form of affection in cat speak! Do not place the new cat(s) in a carrier and set them on the living room floor where the existing cats can circle (and hiss at) them. This is incredibly stressful and makes the new cats feel like prey. This commonly recommended technique often results in an incredibly negative first encounter. Do not physically restrain the cats with your hands, a harness, leashes, etc. in an effort to force interactions. That is a great way to increase the cats’ stress levels and get yourself injured. Do not place one cat face-to-face with another cat. Do not just open the carrier and let them go. These techniques are recipes for disaster! DO NOT put the carrier down and allow your cats to circle the new cats like prey. DO NOT restrain cats with your hands and force them together! Deli meats, roasted chicken, or dinner meat leftovers – NO ONIONS! 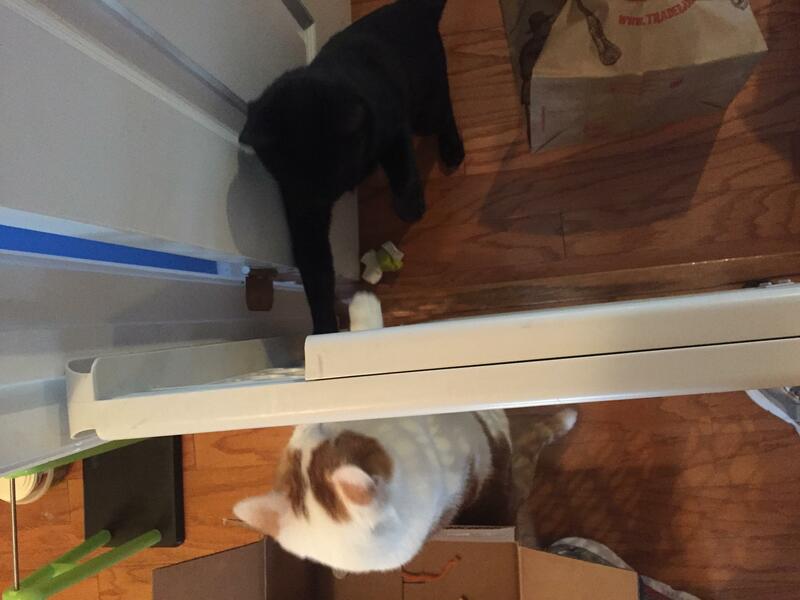 Toys, wet food, a food puzzle offered on both sides of a solid door (& cute footsie). If the cats do not particularly like these food rewards, try interactive toys, brushing, or petting instead. Olfactory enrichment such as catnip, silvervine, valerian, and dried honeysuckle can also be used. Use whatever the individuals find motivating; it does not always have to be about food! In between sessions, encourage other positive associations and facilitate scent exchanges. Cats who live together in a group form a colony odor or group scent. 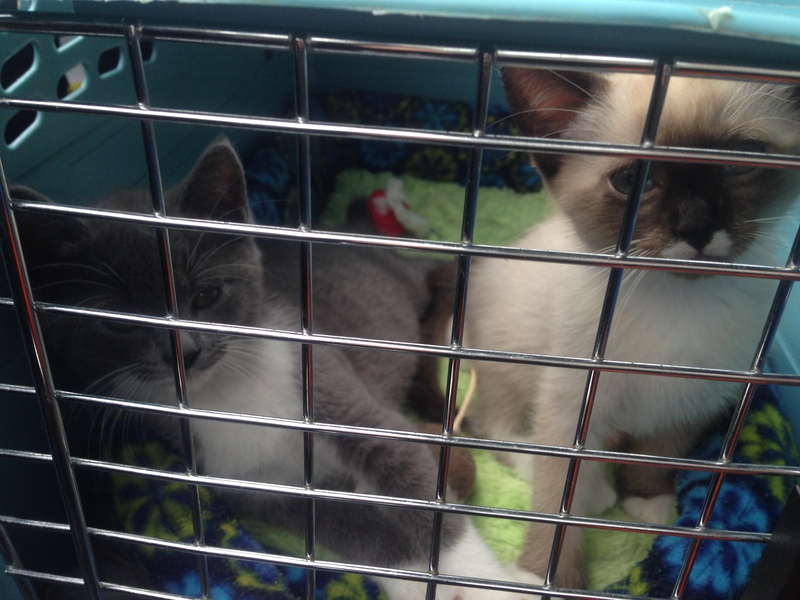 When bringing a new cat home, one of the biggest insults to existing cats is that the new cat smells funny. Some great ways to do scent exchanges are to flip-flop the bedding provided for each cat, swap their toys, and switch out their scratching posts every few days so they can cross scent mark each other’s posts without meeting. Wiping both parties down with a washcloth, old sock, or glove reserved for this purpose is also an excellent idea. Color code the items so you know which to use on whom. What we do not want to do is molest the cats with another cat’s scent! Simply rub the jowls, face, and head of one cat with the cloth and then lay it in the other cat’s space. This allows them to explore the other cat’s scent, hiss at it, rub on it, whatever they choose to do, but we should not rub that cloth all over the other cat’s body. Given the sensitivity of a cat’s sense of smell, this can be extremely insulting. Some commercially available products have been created to help ease tension among cats. Lavender, honeysuckle, and valerian root extract are all scents that have been found to have a calming effect on cats. Essential oils can be toxic to cats if ingested, so offer them in a way that allows for the inhalant calming effects but does not allow them to lick or eat the product. Feliway is another popular commercial feline product. It works by utilizing pheromones and is available in two formulas. The original Feliway formula mimics the feline facial pheromone, making cats feel as if they have already marked a certain surface as their own using the scent glands in their jowls. The new Feliway Multi formula uses the pheromone found in the mammary glands of nursing moms, which reassures kittens and helps them form a bond with their mother. The goal of this product is to strengthen the relationship or build a bond with cats in the home and make them recognize each other as a more cohesive group. Feliway is often used as a “quick fix,” but just like medications, it is not a stand-alone cure. You will get the best results when Feliway is used in conjunction with a behavior modification plan. The next step in introducing a new cat is to create a visual barrier. Double-stacked baby gates are probably the most common item used for this purpose, but you can also use a screen door, French doors, or closet shelving that has been zip-tied together — get creative! Be sure that you have eliminated the cats’ perception that they can scale the gates by thumbtacking a pillowcase, sheet, towel, or similar obstruction to the doorframe. If they successfully get over the gate even once, it will be more and more difficult to deter them. It could result in a cat fight and many steps in the wrong direction. 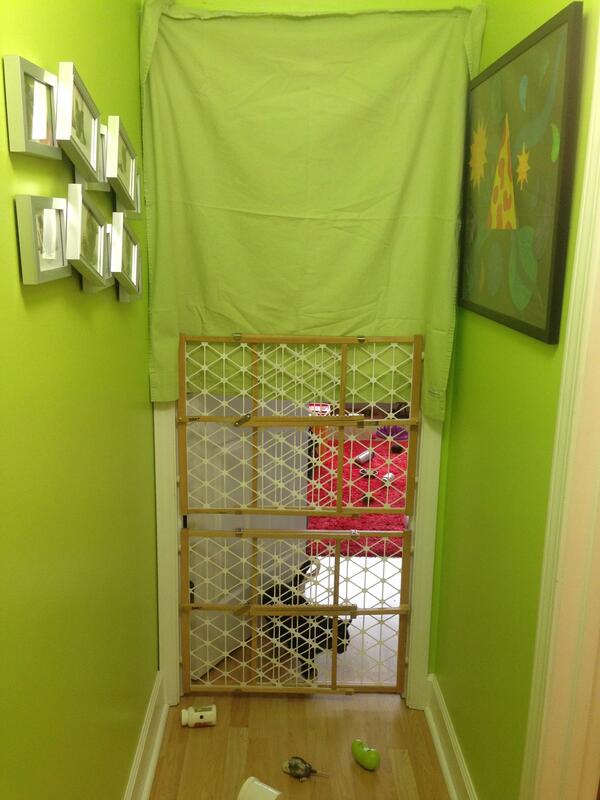 Double stacked baby gates, fabric secured to block perception that it can be scaled. Close up of pinning the fabric into door frame with the gates. Once you’ve set up a visual barrier, repeat everything you did with the solid door. Feed meals on either side of the barrier. Start the bowls far apart and gradually move them closer together. If you reach a point that is too close for comfort, go back to where you were previously successful for a few sessions before drawing them closer together again. 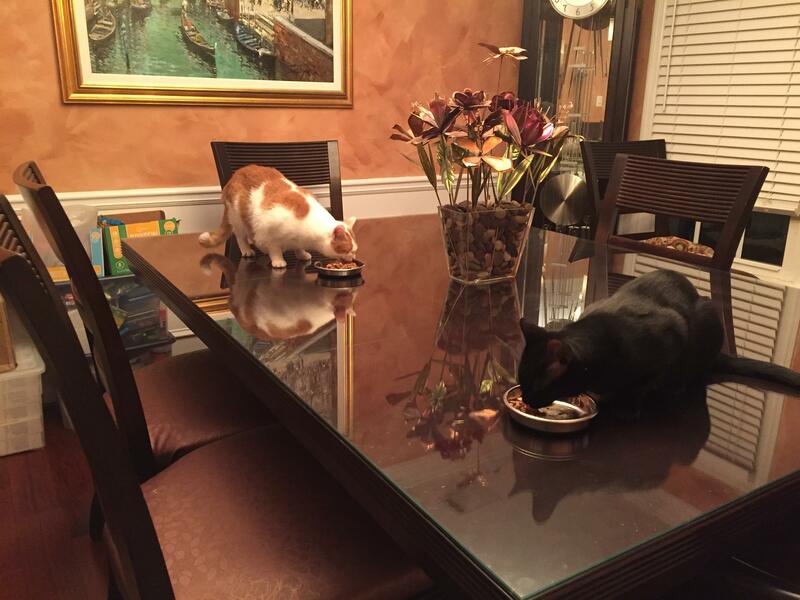 Remember, we are using food as a tool, but cats are not family-style eaters and the end goal — once the cats are living together peacefully — is to have multiple feeding stations throughout the house so they are not forced to eat side by side. Move at a pace that makes them comfortable. During this phase, you may want to allow the cats to explore each other’s spaces. Put the existing cat(s) in a room they already enjoy, like the master bedroom. Allow the new cat to explore the home and get his or her bearings — while able to retreat to their safe room if they get spooked or overwhelmed. 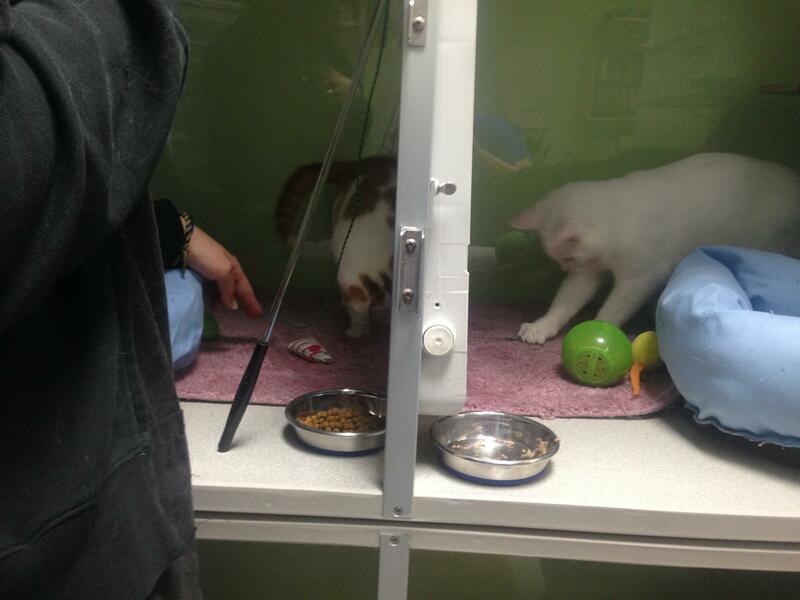 They can discover where food, water, and litter are located without the threat of bumping into one of the other cats. This exercise can build confidence. Each case is unique though. After successfully doing this a few times, you can allow the existing cat(s) into the new cat’s safe room to explore while the new cat has run of the house. This gives everyone a chance to hiss and spit and get their frustrations out without taking them out on each other. 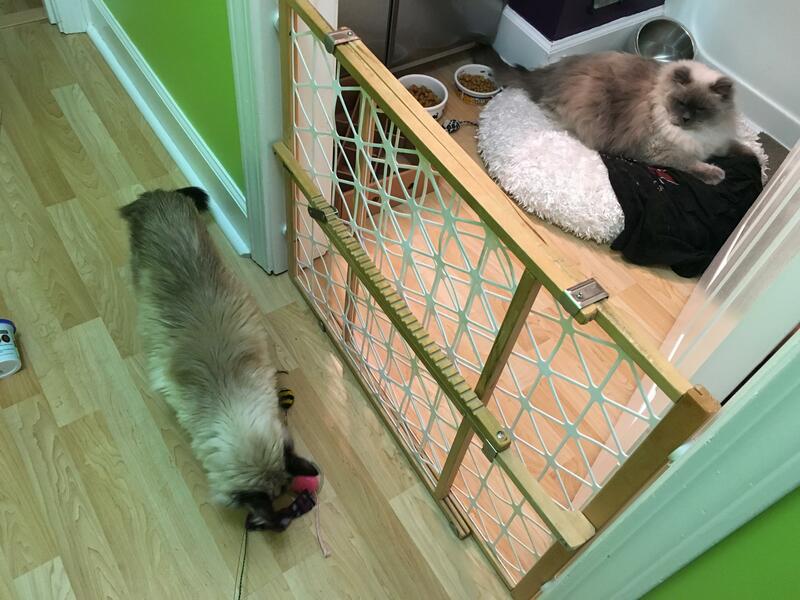 Cats being introduced with the safety of a baby gate. 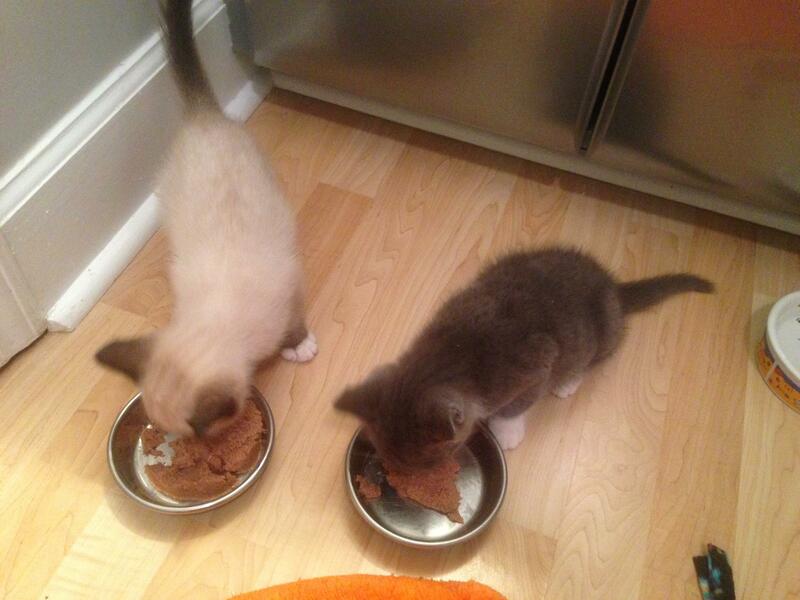 Two cats positively eating together for the first time. Footsies, the gate ensures it doesn't get out of hand. 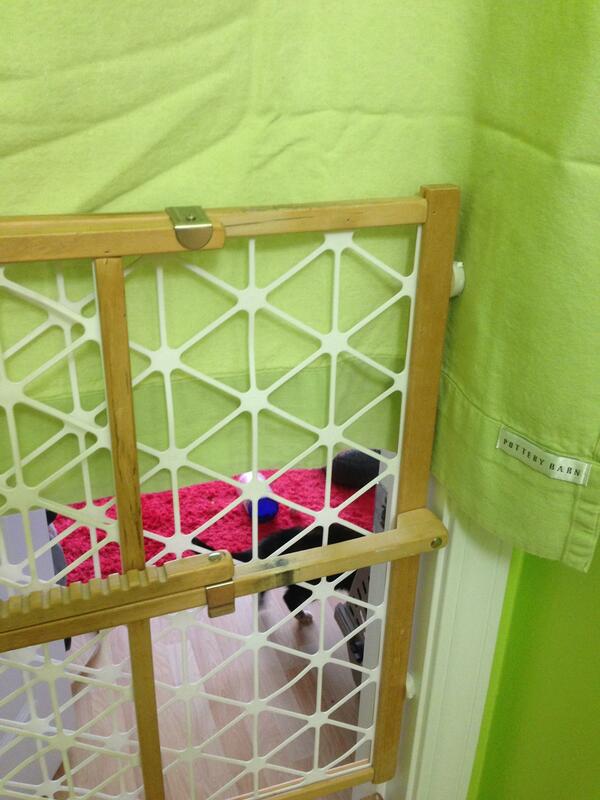 Introduction in a cage at a clinic using baby gates. Play, food, brushing etc. can be a positive tool. Sometimes moving to a fully exposed visual barrier is simply too much for the cats, and we have to go even slower. To do so, put up your visual barrier, but drape a large beach towel, sheet, or blanket over the doorway all the way to the bottom so they can only see about an inch of the other room (basically, all they can see is each other’s paws). Feed food rewards at the greatest distance you can, given your space. This could be 10 feet on either side of the visual barrier if your home allows for such distance. Gradually — every two or three sessions — bring the bowls closer (about six inches to a foot at a time). As that goes smoothly, gradually increase visual sight by lifting the sheet/towel another inch. Continue this way as long as both parties are comfortable eating and staying focused on the reward. If they start to hiss, spit, or lunge at the visual barrier, move back to where you were previously successful for a few sessions. Do NOT move closer together or increase visual access if they are exhibiting these negative behaviors. If there comes a point when the more timid cat will not eat or approach any closer, try elevating him or her! 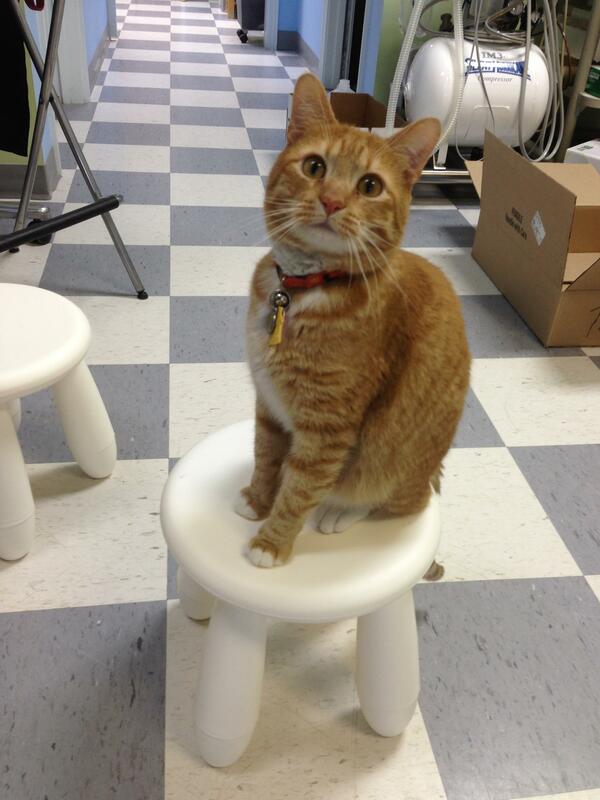 Encourage the fearful cat to get up on a chair, footstool, or small cat condo. The height will make them feel more secure and in control. 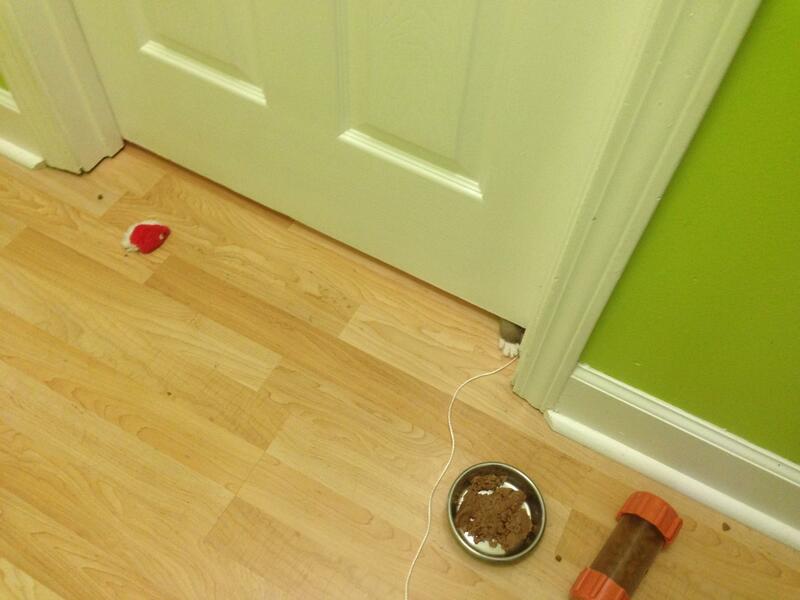 Between sessions, DO NOT leave up the visual barriers and leave the cats unattended. This could result in terrible fights through the visual barrier and undo all of your progress. Close the door to the safe room between each session. Try to always end on a positive note. The session is over as soon as one of the cats is done eating, starts to groom, and/or walks away. Close the door. You are done for now. These short, positive sessions should only take between two and five minutes in most cases. You want to leave them longing for the next time they see each other, because when they do, something good, fun, or delicious occurs. You are paying your cats to like each other! The next step is to eliminate the barriers. Remember not to force anything. This step could be really uneventful at first, which is exactly what we want. 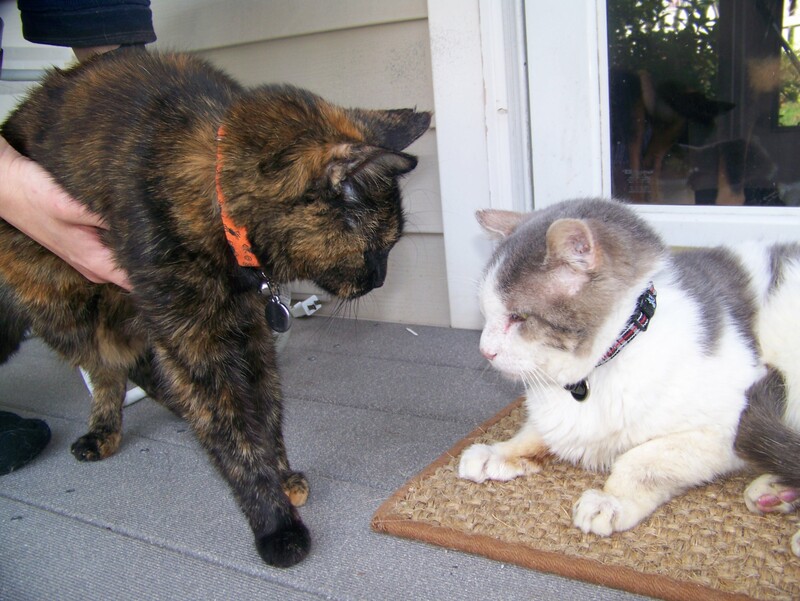 Allow the cats to approach one another at their own pace. 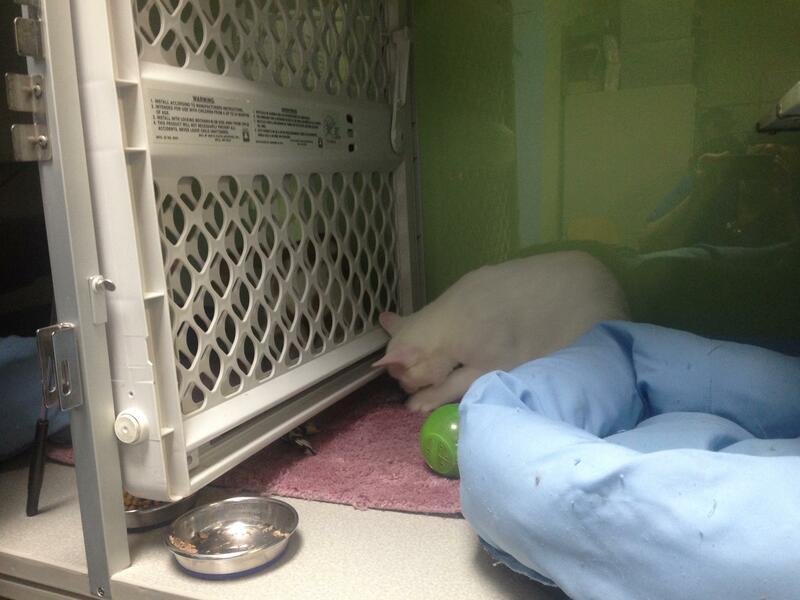 Continue using all of the tools that have worked so far: food, toys, treats, and games. Keep the sessions short and end positively. Gradually increase the amount of time they spend together, but keep them separated using a solid door when you cannot supervise. Elevate timid cats to increase their confidence. Eating together at a distance with no barrier! 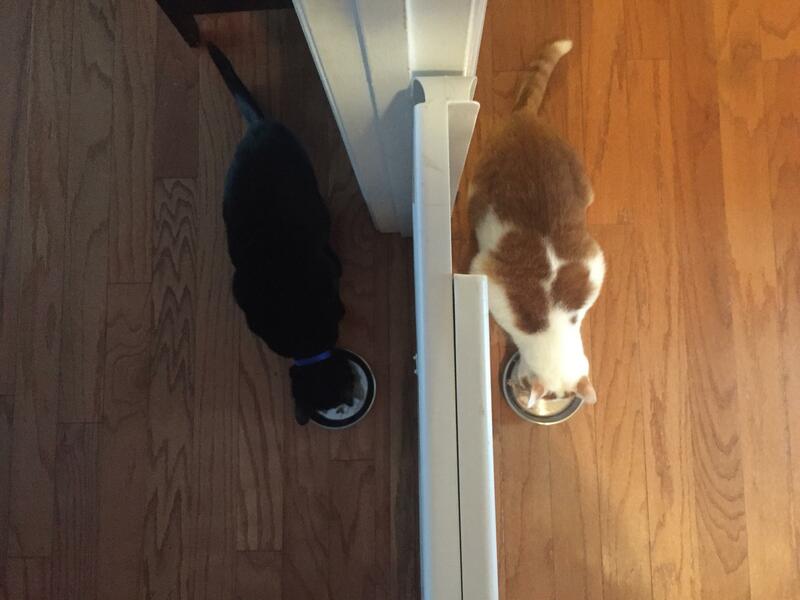 Eventually they are able to eat side by side. What do you do if the fur flies despite all of this effort? Have lure toys readily available for positive distraction so that you can easily diffuse the situation. Be equipped with treats to shift their focus if need be. It’s helpful to have a large piece of cardboard on hand so you can quickly block them from seeing each other should their interactions become negative. Use this if they get into a spitting match, start to posture like they are going to charge each other (turning their bodies sideways to appear larger), etc. Remember, it is best to positively diffuse a squabble. Do not yell at or scold the cats; they are acting normally for them! It is always best to interrupt the behavior and redirect onto an appropriate target. Interrupters should create a “yuck” response. If you make a loud sound, and they run and hide under the bed for three hours, you have instilled far too much fear. If, on the other hand, they think of the interrupter as a game, it is obviously not effective. You have to find just the thing that will make them stop in their tracks, think for a second about what they are doing, and then shift their focus onto an appropriate activity (usually an interactive toy). Some examples of good interrupters are clapping hands, whistling, a noisy plastic bag, or a shake can (you can put pennies in an empty soda can, or add nuts or bells to make it extra noisy). Note: Spray bottles are for plants and teach cats nothing. Their use is not recommended. Once you have successfully interrupted the squabble and shifted focus onto something appropriate, lure the new cat back to the safe room and end the session. 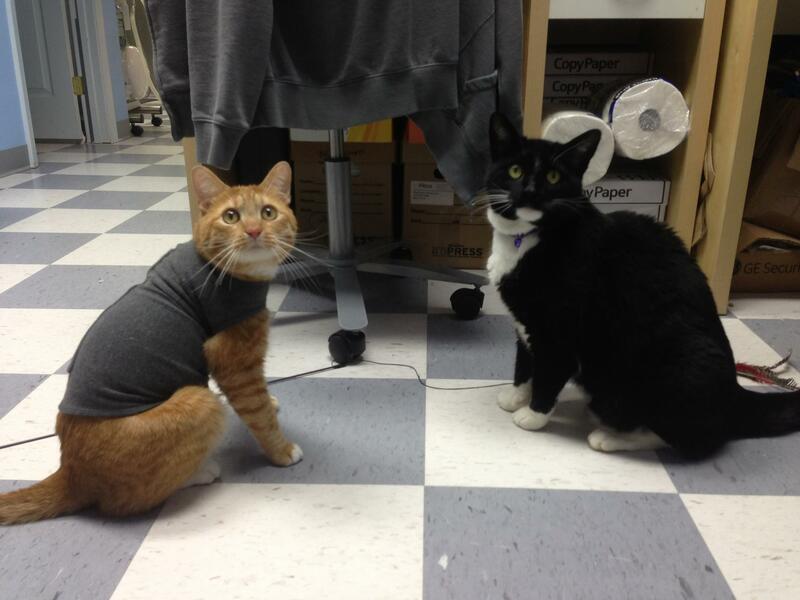 The feline ThunderShirt can also be used as an introduction tool. It can be especially helpful if you have a cat who is acting too aggressively or lunging at other cats. Once they become accustomed to the ThunderShirt, cats can freely move about while wearing it, but it does appear to inhibit their urge to lunge, jump, and even run. The concept of the shirt is similar to swaddling an infant — creating comfort and a calming effect by tightly wrapping them. The ThunderShirt can serve two purposes: (1) having a calming and humbling effect on the aggressor while inhibiting some of their aggressive displays and (2) building confidence in the opposing party by allowing the two cats to spend time together without the threat of attack. Sometimes we may also need the assistance of psychopharmaceuticals, but we like to exhaust nutraceuticals first. Composure treats, made by Vetri-science, contain the active ingredient L-theanine, the same ingredient that causes green tea to have a calming effect on humans. Anxitane, made by Virbac Animal Health, contains the same ingredients in tablet form. Finally, there is Zylkene, made by Vetoquinol, a hydrolyzed milk protein derivative known for its calming effects. Be sure to consult a veterinarian about utilizing these and other medications. When you adopt a new furry friend, a cat is not all that you will be adding to the household. You’ll need more litter boxes too. The rule of thumb is one box location per cat plus an additional box (see “Litter Box Facts” handout for more tips). You will also need more feeding stations, water bowls, scratching posts, beds, and cat condos. Even in a small apartment, you can make enough room for your cats by creating more vertical space. With the techniques described here, you can successfully introduce new cats to existing ones. The moral is that we humans are far too anxious to “just see how they do,” but taking a little more time in the very beginning will help us achieve much more harmony in the long term. If you do it right you will have friends for life. Thundershirt being used to humble the aggressive cat. Follow the steps here for long-term harmony! It's nice to have a buddy by your side as you ponder life.